OMG! I have been spending so much time reading other blogs that I have neglected updating my own. Things are going slow with the updates here at "Just a Cottage Small" but I'm hoping to take a few days off work so I can concentrate on giving the house some TLC. I'll keep you posted on what we decide to do, I tested a few other finishes last night that mimic barn board but I'm not sold yet. The only other progress we've made is coming up with the final colour scheme for the Kitchen along with some great cabinet transformation ideas thanks to Frankie. We are going to use paint from Caromal Colours for the Kitchen in Wisteria and Colonial blue. Oh, I almost forgot ... 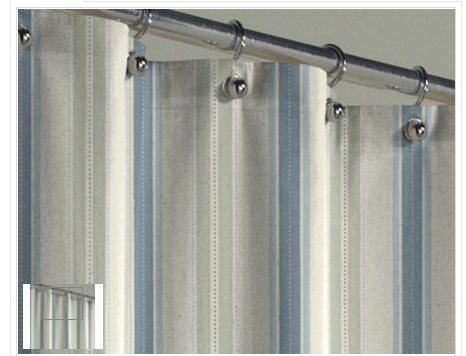 I finally found a shower curtain for a great price ... $20! We had a white Terry cloth one and I found it too bland. I couldn't pin point what was bothering me but once I hung the new curtain I realized since it is a small bathroom everything reflects back at you through the mirror, now there is some interest/pattern in the reflection. 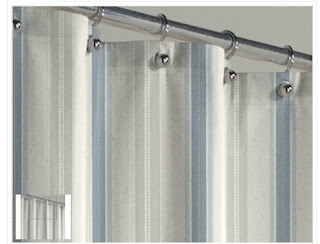 I am just posting a glimpse of the curtain as there is still work to do in the Bathroom before the "reveal".